Members of the youth wing of the Shiv Sena attacked the Holy Cross High School for girls in Kolhapur, vandalising classes and offices in front of pupils and teachers. The police arrested two people, whilst the school was closed. For John Dayal, the incident is part of “the run up to the general elections”. Kolhapur (AsiaNews) – Members of the Yuva Sena, the youth wing of the Shiv Sena, a hard-line Hindu party, vandalised a Catholic school in Kolhapur, Maharashtra. The Holy Cross High School for girls, in Nagala Park, is run by Holy Cross Sisters. The school principal reports that the pupils who, along with the teachers were witnesses to the attack, are in a state of shock. The vandalism “is shocking in itself but is also indicative of the more strident confrontation that fundamentalist groups plan for religious minorities in the run up to the general elections,” said John Dayal, general secretary of the All India Christian Council. The attack by the “youth wing of the Shiv Sena, which is an ally of the ruling BJP, is a matter of grave concern,” he told AsiaNews. The incident took place on Tuesday around 1.30 pm (local time), during class time. School principal Sr Bharati told Indian Catholic Matters that about 20 activists forced their way into the school shouting slogans against the school management. They ransacked the office, breaking windows and damaging religious items, including the cross and the statue of Our Lady. "They complained about the fees and started abusing me and the staff,” Sr Bharati said. 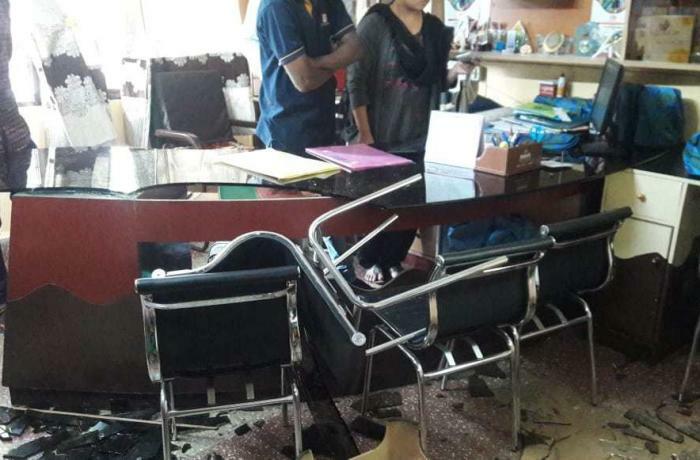 “When I asked them to stay calm and offered to discuss the issue peacefully, they started breaking the office furniture and the glass windows." The girls’ parents issued a statement condemning the attack and defending the nuns. Mgr Thomas Dabre, archbishop of Pune, did the same. “I am sorry and saddened to learn about the attack,” he said. “We are always open for discussion on any matters and issues; therefore, there was no need for such an aggressive reaction on the part of the assailants. This is not the way to settle the issues in a civilised society. Church-run institutions are intended to serve people, especially the poor and marginalised.” The Holy Cross High School is not the first Catholic educational facility to end up in the crosshairs of Hindu radicals. With a nationalist government ruling the country, several Christian schools have been attacked in recent years. The most striking case occurred in January 2018 at the Catholic college in Vidisha, Madhya Pradesh, where extremists tried to forcibly celebrate a Hindu ritual in honour of "Mother India".